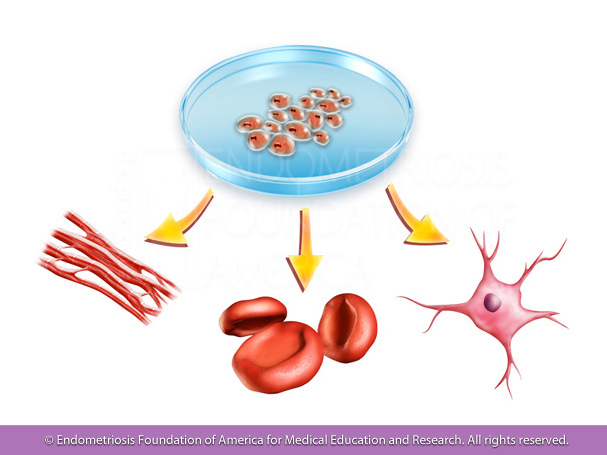 Embryonic stem cells: These stem cells can develop into all different types of cells in the body. They are fairly easy to grow in lab cultures but are believed to have a higher likelihood of rejection by the bodies immune system when injected artificially. Adult stem cells: Adult stem cells can differentiate into multiple different cells, but these cells are often of the same tissue origin. They cannot differentiate into the large variety of cells that embryonic stem cells can. Despite this, they are a highly trending field in the scientific community due to their regenerative abilities and the belief that they have a less likely chance of initiating immune rejection. One of the reasons stem cells are highly studied is due to their ability to regenerate to a variety of cells, such as muscle, blood, or neural cells. Why are adult stem cells such a topic of study? Stem cells are highly studied for two main reasons. The first is due to stem cells’ ability to self-renew through division, even after long periods of time in which they are inactive. The second reason is that their ability to regenerate to a variety of cells allows them to become induced to a wide variety of cells. This function allows stem cells to serve as a repair mechanism, replacing damaged tissue such as in the gut or bone marrow. The mechanism behind this repair process has become a highly studied field amongst the scientific community for a variety of different reasons and disorders, including endometriosis. What is the stem cell theory of endometriosis? The stem cell theory of endometriosis proposes that the regenerative nature of adult stem cells plays a key role in the development of endometriosis. Mesenchymal stem cells, referred to as stromal cells in the scientific community, are a specific type of adult stem cell derived from the connective tissue that surrounds other tissues and organs. These mesenchymal cells are what help make up the lining of the endometrium itself, and their ability to regenerate is believed to allow for the monthly shedding and regeneration of the endometrium. The stem cell theory proposes that these specific stem cells play a key role in not just the regeneration of the endometrium, but also in the development of endometriosis itself. It is thought that if these mesenchymal stem cells spread to regions outside the uterus, they can regenerate, spread further, and be a presumptive cause of endometriosis. How does the stem cell theory of endometriosis relate to a woman’s period? During the menstrual cycle, the body goes through stages of growth and differentiation. This is to prepare the body for possible fertilization. If fertilization does not occur, the endometrium will shed and then regenerate. This regeneration is possible due to stem cells, specifically the mesenchymal stem cells. During shedding, the menstrual blood will contain some cells with this regenerative capability. If these cells spread to ectopic regions (abnormal regions), the cells can differentiate into endometrial cells and cause endometriosis. These cells will then divide and regenerate outside the pelvic cavity, which explains the continual spreading of endometriosis throughout the pelvic cavity and beyond. How do mesenchymal stem cells spread outside the uterus? It is not yet known how mesenchymal stems cells spread outside the uterus. Whether or not this happens naturally or due to some underlying factor, such as genetics, remains a topic of much debate. Many believe that the stem cell theory of endometriosis is the “missing piece” in explaining the cause of endometriosis when combined with Sampson’s theory of retrograde menstruation. These scientists believe that while retrograde menstruation brings menstrual debris outside of the uterus, it is the differentiation of mesenchymal stem cells within this backflow that causes endometriosis to develop. Nevertheless, this remains just a theory and despite a lack of concrete evidence explaining how mesenchymal stem cells can spread to regions outside of the uterus and cause endometriosis, proponents of the stem cell theory still hold true to the belief that stem cells play a pivotal role in the formation of endometriosis. 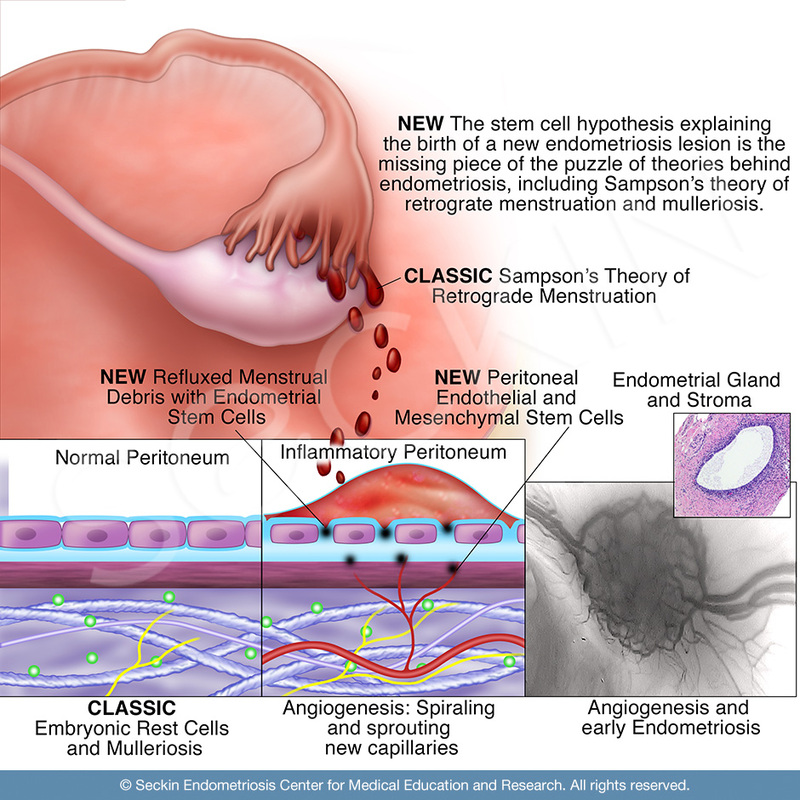 The stem cell hypothesis, combined with Sampson’s Theory of Retrograde Menstruation are proposed theories for the formation of endometriosis lesions. Another theory from recent studies relating to the stem cell theory of endometriosis is that bone marrow may be another source of endometrial stem cells. This is an attractive theory to many stem cell theory supporters as bone marrow-derived cells (BMDCs) are able to circulate throughout the body and differentiate into multiple cell types, such as cardiomyocytes (cardiac cells), hepatocytes (liver cells), skin cells, etc. A non-endometrium source of stem cells could certainly account for many observations pertaining to the resurfacing of symptoms and endometriosis lesions, even following surgery. 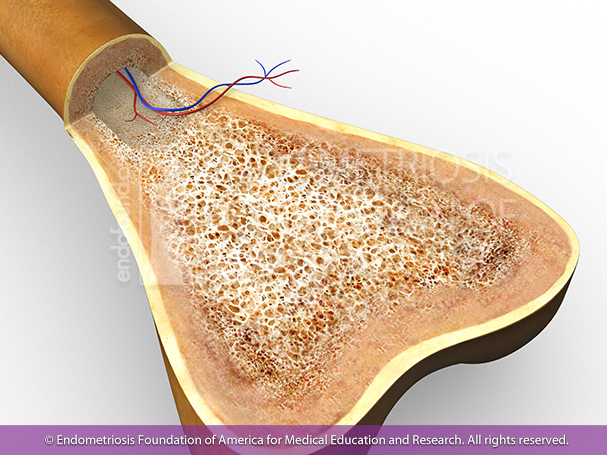 Some believe bone marrow is an additional site where endometrial stem cells can develop and be released. Stem cells are known for their regenerative and repair capabilities. Because of this, many researchers are looking towards stem cells as a possible treatment for many disorders, with endometriosis as no exception. Some researchers have taken to harvesting mesenchymal stem cells (MSCs) and testing them for use in cell-based therapies for endometriosis in order to reduce inflammation. Because of these cells’ low rate of triggering an immune response or tumor development, many have proposed their use as drug carriers in treating endometriosis itself. However, many more studies examining the effectiveness, safety, and efficacy of these methods will be needed before we can truly understand if MSCs can play a part in treating endometriosis.